Here's one I thought I'd never have a repliKate for - Kate's teal Jenny Packham evening gown. She debuted this gown exactly one year ago at the Olympic concert at Royal Albert Hall in May of 2012. There are so many notable features to this gown but what seems to stand out is the neckline. The Queen Anne style, which is how this neckline is called, features an open front with a high, raised collar at the back of the neck. This was also the style of neckline on Kate's Alexander McQueen wedding gown. 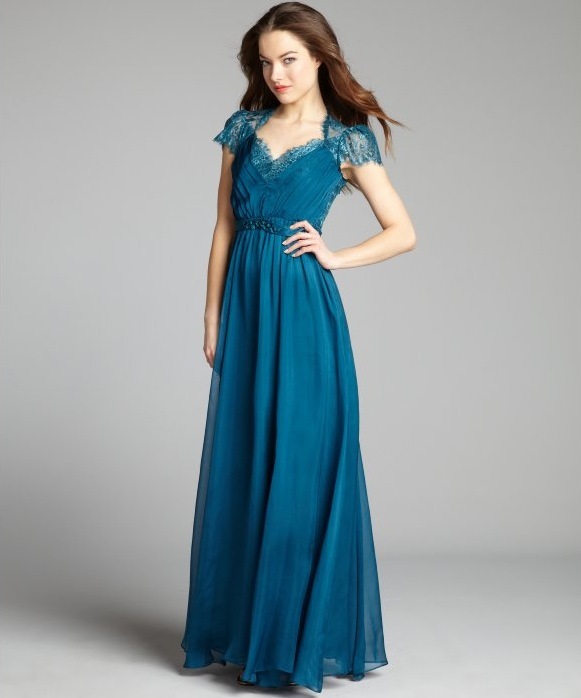 In this case it is a low plunging neckline accented with sheer lace and a pleated bodice. The skirt is also pleated and is finished in a jeweled belt detail. The back of this gown is sheer lace with delicate crystal accents, as are the short sleeves, and it is finished in a button line closure and a bow detail at the waist. Now the color of this gown just bowls me over. I like Kate in a strong jewel tone and I think the gown is lovely - for a Hollywood starlet. This plunge is little low-cut and daring (not in a good way) and paired with that sheer back it is just too filmy and bare up top for her position. I would have preferred to have seen the neckline raised just a bit more so the emphasis would be more on her face, not the daringly low cut chest. A version of this 2012 gown was featured in both the Jenny Packham Bridal collection in white with the style name "Aspen" and the Ready-to-Wear Spring collection in color as look number 8. Customization to Kate's gown was most notable in the color of course, a pleated bodice and skirt as opposed to gathered in the original versions, and a slight raising of the neckline up from the waist a few inches. 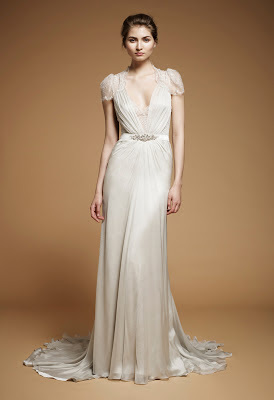 Jenny Packham gowns range in price from the hundreds to the thousands. right, Jenny Packham Ready-to-Wear Spring 2012 collection, look 8. The duplicate I have found is by none other that Allen Schwartz, the replica king famous for his accessible copies of the unforgettable red carpet gown. Just check out his dupe of a famous Stella McCartney gown. This is a very spot on look-a-like with few noticeable adjustments. However the bold impact of the gown remains true to the original inspiration. This gown retails for approximately $562 USD, on sale for approximately $268. Credits: A.B.S. 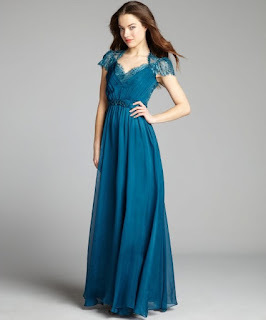 by Allen Schwartz via BlueFly, teal silk chiffon and lace embellished gown. An identical short version of the gown is also available in black. This gown retails for approximately $395 USD, on sale for approximately $239. Credits: A.B.S. by Allen Schwartz via BlueFly, black silk chiffon and lace dress. Thanks for the great tip Anon! I'm off to check them out now. Wish we could see her dress properly as what we have seen looks very good. But then that would be greedy as we have seen her in another tiara!